The DIGICUT HYDRAULIC 215 has hydraulic precision drive for both blade and clamping with infinitely adjustable clamping pressure between 1,900 and 3,800 psi. A pressure guage displays the exact setting. A false clamp plate is included to protect delicate stocks. 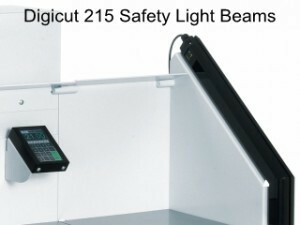 The light beam safety curtain guarantees safe and efficient operation and is standard on the DIGICUT HYDRAULIC 215 cutter. Optional side tables can provide an increased work surface. Power backgauge with fully programmable EP backgauge control module. Digital display for measurement readout in cm or inches (display accurate to 1/10 mm or 1/100 inch). 10-button key pad for presetting of measurement. Memory key for repeat cuts. Programmable EP backgauge control module for 99 programs with 99 steps in each program (up to 9 repeat cuts can be integrated into a program as one single program step). Setting of program steps via Start button. SET function key for reference measurement. 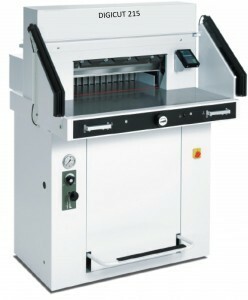 Programmable EJECT function - for pushing out the paper. Two programmable keys for quick setting of frequently needed measurements. Self-diagnosis system with error indication on display. 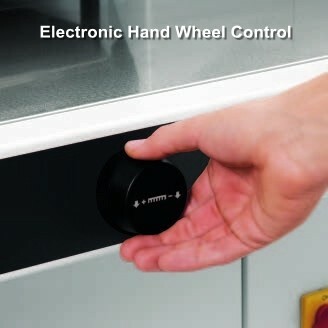 Electronic hand wheel for manual backgauge positioning with infinitely variable speed control (from very slow to very fast). 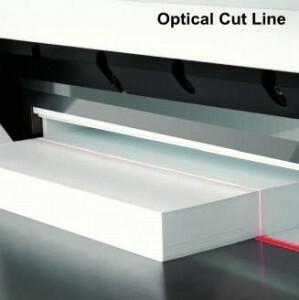 An optical cut line with bright and durable LEDs allow the operator to see precisely where the cut will occur. 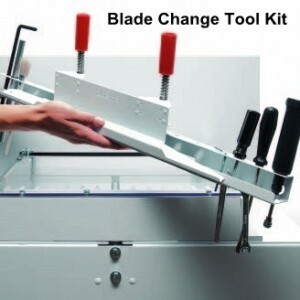 Quality constructed of all steel and designed with built-in safety features. SCS® (Safety Cutting System) package: front safety light beams; safety cover on rear table; main switch and safety lock with key; electronically controlled, true two-hand operation; 24 volt controls (low voltage); automatic blade return from every position; automatic clamp return from every position; blade and cutting stick can be changed without removing covers; blade changing device covers cutting edge of blade; blade depth adjustment from outside of machine.